Well, I’ve done the first, and I hope mentioning the nomination chain does them no disservice. I was just so intrigued by the question I’ve been asked, and the question they were asked, that I couldn’t help but look at some of the other questions my fellow bloggers in this sequence also asked. They are often surprisingly deep and thoughtful. Thus, I am even more thankful to coolbeans for nominating me and giving me this little experience. Second, as for the question, I was asked: If your house was on fire and you could only save one thing (excluding family members/pets) what would it be? Or, in a less wordy way, what is your most treasured possession? Firstly, thank you for not giving me one of those devil-stupid questions about who I would save, because the obvious answer is everyone. 😉 But, supposing that everyone got out safely, almost everything physical that I own could be most easily replaced. Except, of course, for what’s on my computer (and I am cheating and including my external hard drive with that, so haha). On my computer, I have everything about the stories I’ve been working on, the blogging I’ve posted, everything I’ve written, my collection of music and audiobooks, and digital media… in short, it has both my entertainment and everything I’ve ever written and been able to preserve. It’s my external brain, as well as the housing for a portion of my heart and soul. Hands down, I’d save that above all else. To me (and I am sneaking my own answer to this question into this, mwahah! ), writing is simply something I must do to be whole, complete, and functional. Without my words I am a wolf without teeth, an eagle without wings, a fish without gills. That’s why I started my blog, and why I will continue it for the foreseeable future. What is writing, particularly your blog, to you? 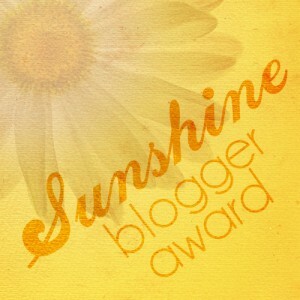 This entry was posted in Blogging Awards, Challenge Accepted and tagged Sunshine Blogger Award. Bookmark the permalink. Hi there! First of all, congratulations on this award. Way to go! Second of all, thank you very much for the nominating my blog, Fujinsei. I appreciate it very much. I’m very happy to be nominated. Unfortunately, I don’t receive this award in my blog, but I’m thankful to be nominated. Congrats & thanks again. Keep up the good work. Cheers!